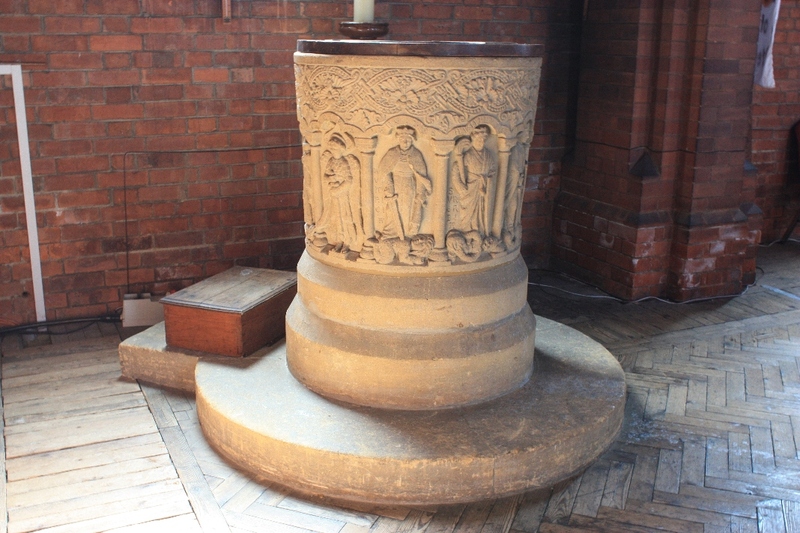 The font was originally sited near the church entrance under the West windows. It was moved to below the lectern in the 1970’s when alterations were made inside the church and the parish room was built. It, with its base and cover, is an exact replica of the 12th century late Norman font in St Leonard’s Church, Stanton Fitzwarren. It is divided into ten compartments, each with a Latin inscription. The first, ‘Eclesia’ stands for the church – and the carving is of the crowned Divine Bride, holding the sacred chalice and killing evil (depicted as a serpent) with the stem of the cross. The second compartment, inscribed ‘Cherubim’ shows a six winged cherubim, with its eyes covered to show its spiritual nature. The Cherubim holds a sword to show it is guardian of the Church. The wooden font cover is also worthy of note, and is also a replica of that at Stanton Fitzwarren. It is divided into four and richly carved with a lion, human, eagle and an ox – symbolic representations of the gospel writers. The cover was donated by Miss Bell of South Marston, in memory of Rev J Mould, a vicar of Rodbourne Cheney.